16 May 2015 Pragmatic or Idealistic Syria? The latest death toll just in the city of Homs after 3 weeks of shelling is 8,000 according to President Sarkozy. This brings the total to 16,000 innocent Syrians dying for their freedom. This week, both Prime Minister Cameron of Britain and President Sarkozy of France threatened Assad with consequences and indictment at the Hague for the crimes he committed in Syria. Both countries closed their Embassies in Damascus. But if we look at the history of indicting, capturing, and holding Middle East genocidal maniacs accountable, no one should hold their breath. In fact, this is the reason why Assad of Syria is neither afraid nor concerned about the empty threats of any EU leader. If there is one extreme case the world and many human rights organization remain in shock over, it’s the case of Omar al-Bachir of Sudan. How did someone kill 300,000 of his own people and yet remain on the loose and in power? Worse than that, he is celebrated in countries like Qatar and Saudi Arabia who seem oblivious to the whole matter of killing innocent women and children. For those who followed Sudan, beginning of February of 2003, one would know how the non-Arab oppressed southern tribes rose against their oppressor Omar al-Bachir heading the Sudanese Government. Al-Bachir armed the Janjawi herdsmen to attack them, which caused the death of an estimated 300,000 people in southern Sudan. The events in Sudan at the time almost mirror those that are happening in Syria today. An oppressed rises against his oppressor and is met with savagery and death. As in the case of the Arab League dispatching a failed mission of some 60 observers to Syria under the supervision of the General that led the Genocide in Sudan, the African Union dispatched, in 2004, some 150 observers to Sudan for the same reason with the same failed results. But unlike Syria, the UN did actually vote for a toothless Resolution 1564 condemning the government of Sudan. It took the international community six years, led by the Bush administration, before it was able to bring the conflict to an end but with one caveat: Omar al-Bachir of Sudan would survive. To make matters even worse, the Hague did in fact condemn him for crimes against humanity and the ICC issued an arrest warrant for his arrest in March of 2009 but the Arab League opposed both on the grounds it will cause instability in Sudan. No kidding, read this interview by the Emir of Qatar in Der Spiegel. 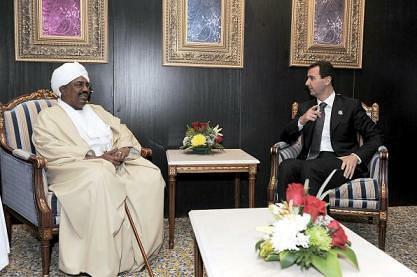 To some in the Arab League members, sidelining a killer causes instability. That’s what happens when one reaches the summit with his pockets full and his head empty. Since March of 2009, al-Bachir has visited several Arab countries openly. The ruler of Qatar even rolled the red carpet for him the same month an arrest warrant was issued against him by the ICC. For the same reason the Arab League defends one of its own murderers to protect its outer shell and against such maneuvers in the future is the reason today why the Arab League attacks Assad publicly but is begging the international community not to interfere in Syria by aiding with military weapons. It just does not want any precedent, so close to home, no matter the outcome. In the case of the Arab Spring, both Tunisia and Egypt took everyone by surprise and the events unfolded rather too quickly for the Arab League to react to or be able to contain their outcome. As far as Libya is concerned, Qaddafi has been on a tear against every ruler of the GCC and Member States of the Arab League were happy to see him go. In conclusion, Assad will be indicted but will not be brought to justice the same way the international community, to this day, has failed to bring him to justice for killing Rafik al-Hariri and many other bright minds like Gibran Tueini. Maybe the Arab League won’t roll the red carpet for him but Iran and Russia will. And as long as Assad has these powerful friends the way al-Bachir has the backing of the Arab League, Assad will roam free even if indicted and an arrest warrant is issued against him. When Europe indicts a Genocidal killer and he remains not only free but in power because the EU leaders are too feckless to impose their will on the Arab League, it does not provides us with any comfort knowing that if Assad is indicted Russia and China still stand by him. Assad knows it and that is why he is fearless in massacring women and children. For that, we should really thank the Arab League for setting this precedent of letting maniacal killers on the loose.